"...be intimate with Me; call Me Mama; have My peace. I love you." There came a time in my life when I had no one...no family...no friends. One of the many miracles of my life is that God, Mother Mary and Saint Therese gave me back a family. I have a sister and a mother again. Mother Mary WANTS us to be intimate with her. I have come to call Her Mamma Mary as she asks us all. 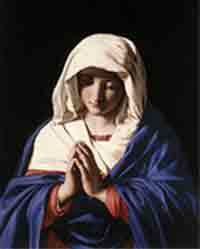 There came a day in my life when I longed, I desperately needed for Mother Mary to be my "for real mamma. "That is how I prayed for this, long before I had read the words above. I would kneel in a chapel near where I worked called the Chapel of the Miraculous Medal. It is a comforting place that feels like home. In it is a life size three dimensional image of the miraculous medal, including, of course, our dear Mother Mary Herself. One afternoon I sat in the chapel telling our mother all my troubles, as a daughter would tell her mother when things had not gone right in her life. I just spoke from my heart. I asked her to be my "for real mamma." As I looked up at the statue of Mary, with the sweet almost life like expression on Her face there was a bright light that filled that end of the room. My prayers where answered when the statue of Mother Mary began to breathe! She showed me that she was my "for real" mama. Months later I was shown the words above by my sister. Mother Mary is always there for me, to comfort me and watch over me. She will do the same for us all. Mary is also the Queen of Heaven. She is the Mother of God and Mother to us all. God tells us so himself. The following is a conversation that took place on February 10, 1988 between God and Vassula Ryden. The words in italics and red are words from Our Lord as dictated to Vassula, Vassula's words are in blue. “Vassula hear Me and write"
You have come introducing Yourself as God then said, Your Mother twice, You have Lord just declared that St. Mary is Your Mother, therefore confirming the title of: 'Mother of God'. You have said it Lord! A title rejected by Protestants. How I rejoice daughter, I have not been teaching you in vain, I am pleased that you have understood My Works, endeavour to keep up your learning, pray for this attainment, I will give you the perception if you ask for it, Vassula, hear Me again, I want My Words to be known, I who is God grew in My Mother's Womb, She nourished your God creation! I fed from Her I who is the Word love Her and honour Her Vassula in the very beginning I had given you an account of My Crucifixion, remember when I have said, "My gaze fell on My Mother, I looked upon Her and Our Hearts spoke1 I am giving you My beloved children to be Your children too, You are to be their Mother." Yes Lord, but our brothers the Protestants say that what You uttered from the Cross was meant litterally to John. Your Mother becoming a 'widow' being taken care by John when You were not around. They also say that St Mary is not 'God's Mother'. Yet My Vassula Scripture never lies, Scripture says those words, 'Mother of my Lord'; Elizabeth spoke these words who was inspired by the Holy Spirit, write: 'Of all women You are the most Blessed, and Blessed is the Fruit of Your Womb. Why should I be honoured with a visit from the Mother of My Lord?' the words I have said from My Cross are much deeper than many of you seem to understand; honour My Mother who is your Holy Mother too. Rest now in My Heart, please Me by remembering My Presence, honour Me My Vassula. "She has never ceased protecting Her children from the ambushes of the Evil one, who in your times, has set out openly to give battle to My Sacred Heart, and to all the army of My saints; but soon the empire of the Evil one will be broken up and his sovereignty will be uprooted by the powerful Hand of Mary. In all truth I tell you: there is no one on earth or in heaven or in the angelic powers, that has been given such great authority and power over all as your Blessed Mother, after My Power and My Authority; for I am the Alpha and the Omega, the First and the Last, the One who is, who was, and who is to come. I suffice by Myself, as you know, but it is through Mary’s Virginal Heart that My Redemptive plan began, and it will be again through this Holy Heart that I will accomplish My Salvation plan. So honour Her Heart, you who fly into a rage at the sound of Her Name, and understand that She is the Joy of My Sacred Heart, the Joy of My celestial court. Her thoughts from the day of Her Conception were always in union with My thoughts; Her Heart, in total submission to My Father's Will, was an incessant prayer, an incessant hymn of love, an adoration to Me your triune God, but One in the unity of essence. Today, in these end of times where the battle is raging on Our Two Hearts 6 and on Our children who witness the Truth, I tell you: run to your Blessed Mother, who, like a hen who hides her chicks under her wings, will hide you too under Her Mantle."